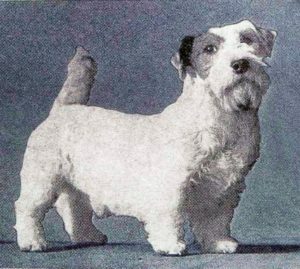 Best in Show 1924, Champion Barberryhill Bootlegger, Sealyham Terrier. This week is about as good as it gets for dog lovers. Last night was the amuse bouche when a gorgeous yellow lab puppy arrived just in time to sweep away the gloom at Downton Abbey. And closer to home, with more than 3,000 immaculately groomed pooches in town to compete in the 2016 Westminster Kennel Club Dog Show today and tomorrow, midtown Manhattan is once again Show Dog Central. The main staging ground is Madison Square Garden, where American caninedom’s show of shows unfurls. But even the pluckiest Pomeranians, Poodles and Portuguese Water Dogs crave a cozy room and comfy bed after a long day of good behavior. Three hotels within the garden’s orbit specialize in putting up show dogs (and their minders) each February. That means dog enthusiasts who chance by the lobbies of the Hotel Pennsylvania, The New Yorker and the Manhattan NYC — an Affinia Hotel (formerly the Affinia Manhattan) have a greater than average chance of seeing some hot dogs as they head off or return home from the Big Show. Though spots to sit down are scarce at the Hotel Penn, dogs are not. Situated directly across the street from the garden, the enormous Hotel Pennsylvania courts show dog owners with its enormous indoor Room to Groom S’paw in the basement with bathing tubs, a grooming area, spaces for exercising and a designated in-house relieving area. Westminster participants also receive a welcome package and treats and the services of the hotel’s Dog Concierge, who helps out the owners. With its red marble floor and imposing Art Deco chandelier, the lobby at The New Yorker is a spacious backdrop for dog watching. And though a recent refurbishment cut back on lobby seating, you can still score a spot on a trim leather sofa and watch the unofficial parade of champions. Bonus: the Tick-Tock Diner adjoins the lobby and is open 24 hours. The elegant lobby at the Manhattan NYC is also inviting, designed as a conceptualized take on the island of Manhattan. It’s a handsome promenade for dogs to make an entrance (or exit). The hotel also goes all out for dog owners, offering a special dog suite on an upper floor outfitted with sofas, water and dog biscuits and an outdoor dog run layered with astroturf so dogs can exercise without leaving the hotel. As I discovered when I visited a couple of shows back, the suite feels social, as trainers and owners greet old friends, compare dog-world notes and made sure their animals stay pristine, and scratch-free, for the big show. Meanwhile, Dr. Richard Meen is doing is best to stay away from prized pooches. As the man who will pick Best in Show he wants to stay relaxed and impartial, a New York Times story reports. So he’s sequestered at The Warwick Hotel, pet friendly but more than 20 blocks from where the top dogs are. With Plans Approved for a New Midtown Skyscraper, Is This a Last Look at the Hotel Pennsylvania?